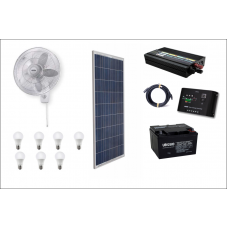 Solaroid Energy 150 Watt Solar Panel Kit is ideal for customers who want to enjoy 24hrs power supply for home appliances like Television, Laptops, lighting, fan, and charging of phones. It's a do-it-yourself solar panel kit, which is affordable for home or offices, that need to power a number of home electrical appliances. It includes a portable solar panel, 1000VA inverter with a charger, 100 Amps 12V battery bank, 10A charge controller, 10 LED light bulbs. It's a diy home solar system kit. The 150W Solar panel kit is an improvement on the 80 watt and 100 watt Solar panel kit. If you are looking for a solar system to power your home or office basic appliances, the 150 watt solar panel kit is the answer you've been looking for. We sell affordable diy home solar power kits and inverter kits for N139,999. This solar package is designed to provide you with the main components you will need to power basic appliances in your room or home! The systemm is ideal for a single room or a bigger apartment; it will power all basic appliances like rechargeable fans, electric bulbs, 24” TV or laptop computer and charging of phones. The 60W solar package includes the basics that you'll need for your solar installation. The components includes 60W solar panel, one 20AH, 12V battery, a 10Amp charge controller and a 300VA Inverter, you can call us on +2348029541015 for more information and support and how you can order for the system. This package is a do-it-yourself system and an additional charge of N25,000 will be incurred for installation costs! The sharp 200W solar panel is safe, clean, reliable energy source that will serve as an effic.. This LG 280 Watts solar panel is all you need to carry out your solar system installation:The 280W S..
Solaroid Energy 50 Watt Solar Panel Kit is ideal for customers who want to enjoy 24hrs power su..
Solaroid Energy 300 Watt Inverter Kit is ideal for customers who have access to 6 to 12hrs of e..